Charlotte Gleason is a wealthy and spoiled young woman whose world changes when her father bring shame and financial ruin to his family. Dora Connors is Charlotte’s maid since they were both thirteen. Their relationship borders on friendship withheld from all its benefits because of social boundaries. But all that changes when Charlotte, accompanied by Dora, is sent to America to marry a very wealthy heir. But upon arriving, Charlotte decides to switch places with Dora. The masquerade begins. I thoroughly loved reading this book. I liked the premise, and I felt the author was able to pull it off well. In some aspects, this novel reminded me of a Jane Austen book. It is character-driven and full of events that kept me guessing until the end to see how it would all turn out. Both Charlotte and Dora are likable characters. Their personal growth (mainly because of their changed circumstances) as the story progressed was the impetus that kept me loving every page I read. I especially enjoyed the Italian immigrant Scarpelli family, since my relatives, grandparents and parents are immigrants who carved a life in America and Canada. The Italian phrases brought a smile to my face, and I appreciated the author’s research of what life was like for many immigrants when they first arrived in America. It made me look back on my family with admiration for leaving everything behind to start anew in a strange land. The ending came a little too quickly (maybe because I was enjoying the book so much) and I felt the romantic involvements weren’t fully developed. Both Charlotte and Dora’s love interests were men I would have liked to know better. So few words were exchanged between Dora and Edmund that it left me craving for more. However, since the main focus of the book is not really romance, this is but a minor setback, and as I said I loved reading this book. The story explores friendship, the value of honesty and finding one’s purpose in life. It is filled with vivid scenes that would allow for a great transition to the movies. 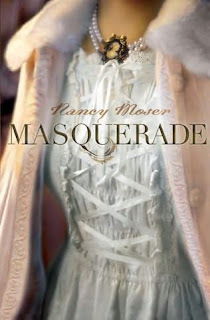 No doubt about it, Nancy Moser has made it on my list of favorite authors. I'm so glad you loved this, because I think the cover is just gorgeous! This book sounds soooo interesting - yet another book to add to my TBR pile! Your review was excellent, Laura. This sounds like a delightful read (and I can relate to the Italian immigrant part except mine settled in America)!